Café Slavia is a traditional grand Art Deco style café by the Vltava River in Prague, next to the National Theatre. It has huge plate glass windows running along two sides, through which visitors can watch trams rattling by outside and gaze across the river to Prague Castle. Café Slavia is open from 8am with a selection of breakfast dishes, coffee and other beverages. In the afternoon and evening, Café Slavia is an ideal place to take a break from the sightseeing, to enjoy a drink and a cake. The coffee and the beer is good, but the hot chocolate, made from melted chocolate topped off with cream, is sublime! As for the cakes, they are delicate, smooth and beautifully presented - but prepare your choice: once you have your table, walk to the cake counter (situated by the entrance), decide on a cake and note its number. Return to your seat and tell the waiter your choice when you place your drinks order. To complete the atmosphere, a pianist plays from 5pm-11pm every day, and he is really rather good. Café Slavia opened in 1881, the same year as the National Theatre, and became a meeting place for artists and intellectuals. By the 1920s and 1930s Prague was experiencing a golden era, and there were hundreds of cafés vying with each other in style and luxury to attract the burgeoning café society. However, later on Café Slavia was one of only a handful to survive the communist era (when former president Vaclav Havel was a frequent visitor). During the 1990s it was restored to its 1930s Art Deco style. Czech people regularly meet their friends and families in cafés. 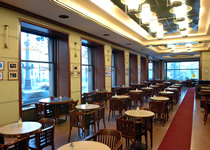 As one of the more popular ones, Café Slavia is always busy. It is has an air of formality, but at the same time is relaxed enough not to impose dress codes or for any visitors to feel out of place.